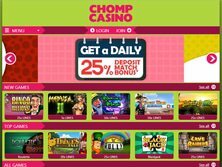 Chomp Casino does not attempt to wow the player with intricate design on the main page. Instead, the casino has chosen to focus on exposing the games that are available on the website. The player gets to choose between real money play and the free to play option. The venue draws the player with familiar as well as exotic-sounding game titles. It also attempts to showcase its best bonus deals. A few of the promotions certainly deserve much wider exposure, since they give a big advantage to the player. It's great to see see a casino that has invested time in building a nice promotions section. The section can rival the competitor's offerings. The casino starts to provide deals soon after the player's registered account has been validated. Five pounds are immediately given out for free. No deposit is required to take advantage of the offer. The money can then be used to play the games. But the welcome bonus offer is truly extraordinary! Five hundred pounds are made available on the first three deposits at the venue. The first deposit enables the player to get a 200% cash match up to 50 pounds. The second deposit is a 100 % cash match up to 200 pounds in bonus. Lastly, the third deposit is a 50 % cash match up to 250 pounds in bonus. The Happy Hour deal occurs from Monday to Thursday between 2pm and 5pm. A deposit of 10 pounds can result in a bonus of 25% up to 50 pounds. On Tuesdays, the players can expect to receive 10% cashback up to 50 pounds on losses at the casino. Furthermore, the venue has prepared a VIP Circle. The access to the circle guarantees special rewards and bonuses. More importantly, the player gets a tailored customer support service experience. The casino is popular in England. It has received the endorsement of the UK Gambling Commission. However, the residents of certain jurisdictions may not be able to play on the website. The players from the U.S. are unable to access the games at the casino. The restrictions don't just apply there. Other countries may also be included. That said, the players from Europe are choosing the casino in large numbers. The constantly updated website will likely continue to appeal to people from the region and beyond. The desktop and mobile casino provides superb opportunities for players who want to be entertained! The blackjack and the roulette game have been getting the bulk of traffic on the website. That's why it is important to understand the appeal of the games. The roulette is the classic game (The origins of it lie in the 18th century) that can be found at most online casinos. However, the gaming environment can differ significantly. In order to understand the rules of the game, it is important to thoroughly review the board where the bets are placed. The blackjack game is basically a comparing card game. The action takes place between the player and the dealer. The player must beat the dealer in order to be successful in the game. The players are not complaining about the small size of the casino. The Chomp Casino Bonus has not been criticized either. In fact, the public forums do not feature any criticism of the place. This may have something to do with the fact that the casino is still fairly new (It was started in 2014). The language support is provided in the English language. 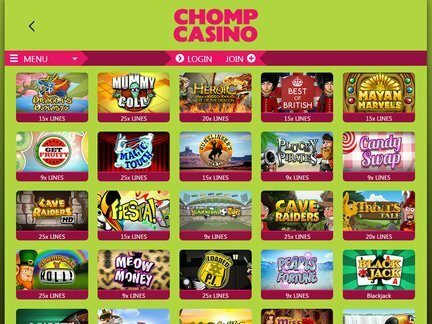 In terms of any help, the Chomp Casino customer support service can be reached via e-mail and phone. The casino is licensed by the Government of Gibraltar. It has also received a license from the UK Gambling Commission. I wasn't disappointed with the small number of games on the site. I felt that the games were selected rather well. I was also happy to play the classic casino games in this particular environment. However, I was most satisfied with the large promotional offer at the site. The Casino Chomp No Deposit Bonus is an amazing deal that is definitely worth checking out. I did not notice any similar promotions on other casino websites that I've had a chance to visit.